and NATURE's CALL of concern. Can we just as easily work up an APPETITE? Personally, I would have to be terribly sick not to have my great big appetite! 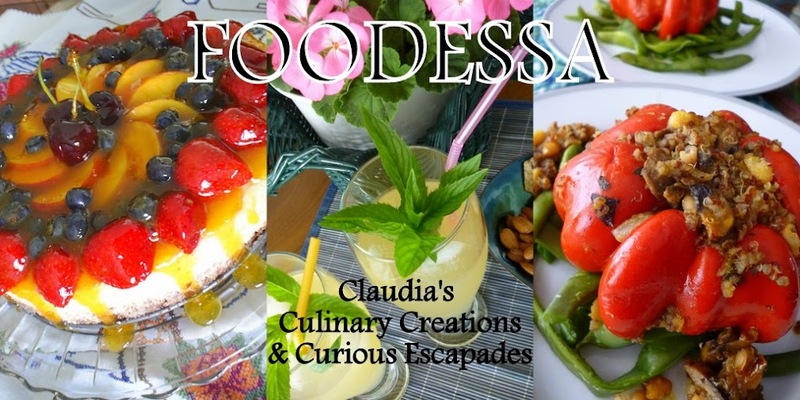 just looking at great food...will skkkream APPETITE! However, especially on weekends ... 'Hubby' our 'doggy - Sushi' and I work our appetites by going outside and 'out of the kitchen'. This way we feel re-vived and also less guilty about devouring a delicious BRUNCH. I couldn’t quite pick what was going to be more exciting...the breathtaking nature walk or the mouth watering brunch we'd be having. We worked up our appetite by putting on some wears to face what's leftover of the winter season. We're definitely not used to this very welcomed mild weather. However, for myself ... other than overwhelming snowstorms ... I do quite enjoy a thick carpet on winter wonderland. As such...the reverse has be unfortunately true for other parts of the world. The drastic drops in temperature have not only made populations uncomfortable...it has also disturbed the eco-system in a way that most of us don't quite realize. I have been quite disturbed about what our nature dependant land and marine life animals have had to endure this past unusually cold season. Especially, for the green sea TURTLES around the east and south coasts of the United states. Imagine...how surprised I was to also find out that at this natures' park where we go walking...there are some turtles too! 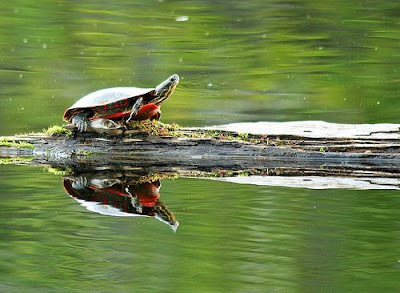 They are sweetly named by the park care takers as the ‘popsicle’ turtles. They apparently make their route to Quebec all the way from Mexico! lost to these terribly changing temperatures! "On Friday one lucky green turtle got a second chance at life, after being found by an Anna Maria Island Turtle Watch volunteer. Suzie Fox directs the Anna Maria Island Turtle Watch and Shorebird Monitoring organization. She said the organization has rescued 30 freezing turtles over the past two months, which is unusual since they normally do just a few a year." and then later release them back into their natural habitat. is critical to preserving some of the environments we enjoy most. It sure makes you cherish your somewhat controlled choices. As a human being...although we are not completely protected from mother nature's harm...we do have the abilities to somehow foresee some protection. Most animals do feel something is wrong...and yes they can at times protect themselves too...however, unfortunately, most times...nature leaves them no choice but to have them surrender to the wild temperatures, and unforeseen moments that will bring their demise. 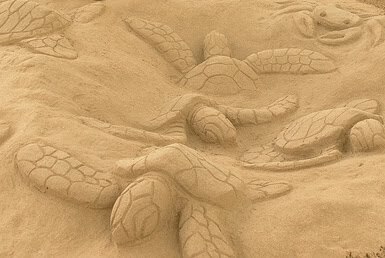 Did you also know that there are now fewer male turtles being hatched. It seems that the changing global temperatures is also causing this other concern. 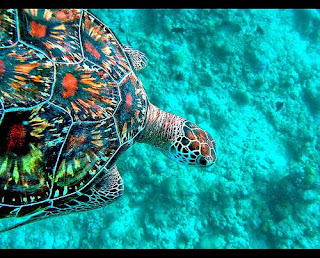 If you're curious to know more about this strange phenomena...you can follow this news piece...by clicking here: " Sea turtles to hatch fewer males "
There is at least one bright light at the end of the tunnel...winter is soon over...and these sea turtles can once again mate and reproduce under some controlled protected environments. I remember a few years back...during our daytime travel to an island off the Caribbean coast of Venezuela, having a very memorable close encounter. One day we were being brought to a semi-deserted island to enjoy crystalline turquoise waters. The chosen transport had been a small somewhat disturbing row boat. While in a very small mode of transport...we were blessed with a beautiful vision of a huge ' loggerhead ' TORTUGA swimming by graced us with its presence. 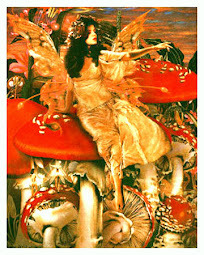 I quickly froze out of immediate unfounded fear...but quickly relaxed and became a child again. It was like opening a gift to a brand new toy. These animals are quite impressive. How fortunate 'hubby' and I felt to have now seen at least one of the turtle species in person as opposed to have to visualize them on paper. It was unfortunately not where most sea turtles are found around the stunningly beautiful 'Los Roques' archipelago where mostly 'green' and 'loggerhead' sea turtles co-exist. using these beaches as nesting grounds. opportunities to visit with their presence. On some other trip maybe? 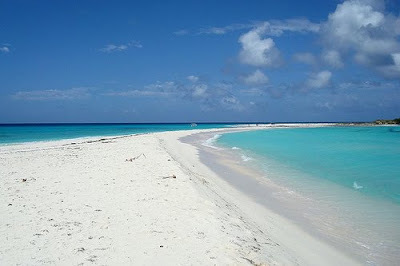 islands of LOS ROQUES where a paradise awaited. Here's a direct quote from: whl.travel.com...describing this stupendous tropical paradise... "Stretches of picturesque beach meet a crystal-clear sea teeming with schools of colourful fish. Over the centuries, this near-utopia archipelago has seduced many tourists into full-time residence with its isolation, charm and stark beauty. It was even once described by Christopher Columbus as ‘heaven on earth "! That same day, I remember also being informed that where we were going to be left off on semi-deserted island...we were to be aware of possible turtle nesting. We were not as lucky as some to have seen a miracle such as the below photo taken somewhere in Central America by the Pacific ocean coastline.
. Depending on species, they may lay clutches containing on average 50-160+ eggs, and may lay more than one clutch in a season. 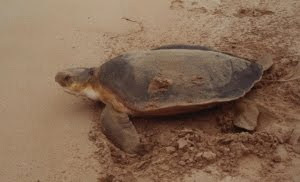 Flatback turtles (endemic to Australian waters) lay the smallest clutches (approximately 50 eggs per clutch).
. Do not approach an adult turtle coming out of the water to nest. You may startle her and she may return to the water without nesting.
. Do not position yourself in front of a nesting female. This action may cause her to abort her nesting attempt.
. Avoid using flashlights or flash cameras. Lights disrupt or disorient nesting turtles and emerging hatchlings.
. Watch for and avoid hatchlings emerging from a nest. They are small and easily stepped on.
" 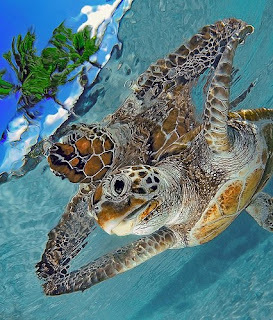 Sea turtles have long fascinated people and have figured prominently in the mythology and folklore of many cultures. 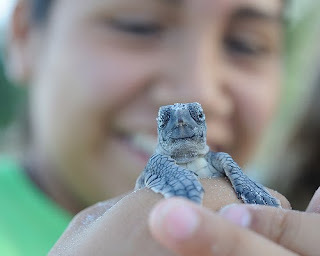 In the Miskito Cays off the eastern coast of Nicaragua, the story of a kind "Turtle Mother," still lingers. 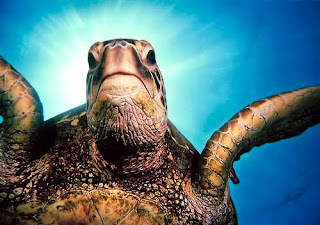 Unfortunately, the spiritual significance of sea turtles has not saved them from being exploited for both food and for profit. Millions of sea turtles once roamed the earth's oceans, but now only a fraction remain. It seems that I have gotten carried away again. I have found this all too fascinating and educational. Named for its exceptionally large head. It has heavy strong jaws and a heart shaped carapace. Named for the green color of the fat under its shell. 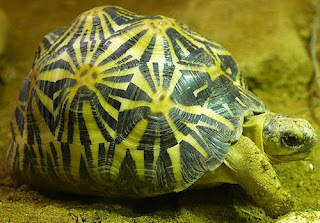 The carapace color varies from pale to very dark green and plain to very brilliant yellow, brown and green tones with radiating stripes. Named for its narrow head and hawk-like beak. 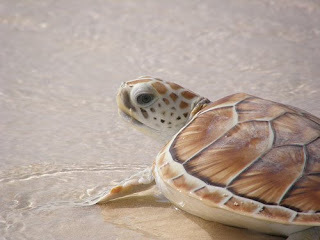 It is one of the smaller sea turtles. Named Kemp's after Richard Kemp, who helped discover and study the turtle. 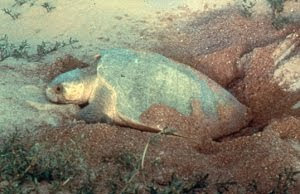 No one is sure why it is called ridley, possibly due to having similar nesting behaviour as the olive ridley. Named for its olive green colored shell. Its body is deeper than the very similar Kemp's Ridley sea turtle. Named for its flat carapace is olive-grey with pale brown/yellow tones on margins and the flippers creamy white. Named for its unique shell which is composed of a layer of thin, tough, rubbery skin, strengthened by thousands of tiny bone plates that makes it look "leathery."
. 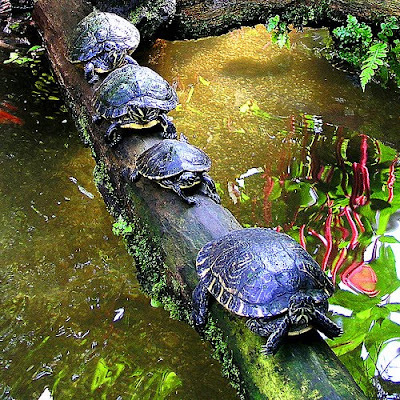 Did you know where the largest population of turtles are found? Scientists identify the world's largest population of leatherback turtles in the coast of Gabon, West Africa. The discovery was possible thanks to thorough aerial survey of nesting beaches combined with ground monitoring. 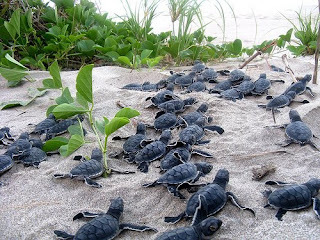 The survey estimates that between 15,000 and 43,000 leatherback turtle females nest on the beaches of Gabon. The number is considerably higher than the expected 10,000 to 15,000 females.
. What are the preferred Foods of SEA TURTLES? 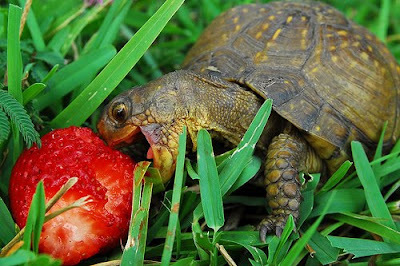 Loggerhead turtles generally feed on both plants and animals but they are mainly carnivorous. Their diet contains various species of algae, including Sargassum weed, which as hatchlings they also utilize as a 'float'. After emerging from their nests, leaving the beach, and moving into the open sea, they drift into deeper water which carries them into the Sargassum weed. This weed provides them with cover from would be predators and collects floating objects including zoo and phytoplankton which they feed on.
. What was the LARGEST size turtle ever found? 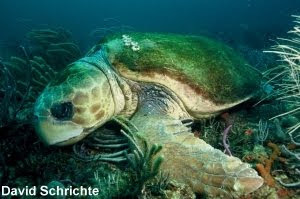 The largest species of sea turtle was the Archelon, which measured 7m in length and lived in Prehistoric times. Today, the largest living species is the Leatherback. There are 2 sub-species, the Pacific Leatherback and the Atlantic Leatherback. 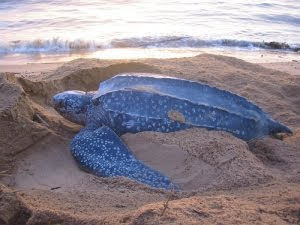 The Atlantic Leatherback is slightly larger than the Pacific population. Leatherbacks measure an average of just less than 2m in carapace (shell) length. plastic and rope, which they mistake as food items.
. How long can a sea turtle hold its breath? And why do they drown?
. 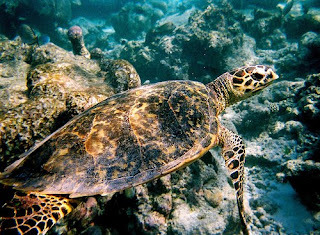 Are there any diseases in sea turtles that are transferable to humans and vice versa? Numerous bacterial infections have been identified from sea turtles. 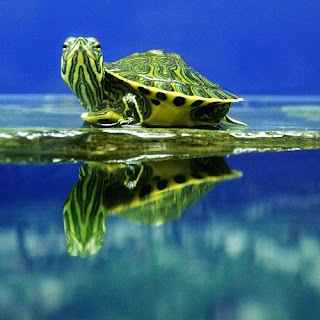 One type of bacteria that is transferable between turtle and humans is Salmonella, present in all turtles (land, fresh water and sea turtle species). 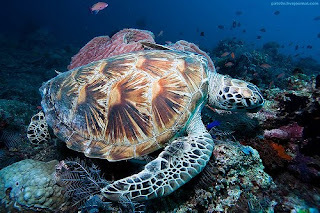 It is advisable when handling a sea turtle to wear latex gloves or if not available, to thoroughly wash hands both before handling the turtle to rid of any bacteria on our hands, and after handling to rid of any bacteria on the turtle.
. What is the importance of sea turtles? Why try to conserve them? Sea turtles make substantial nutrient and energy contributions to beaches, promoting plant growth, stabalising beach and dune systems. 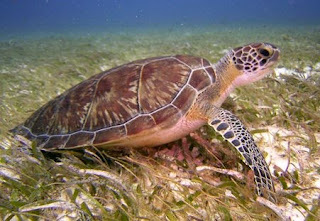 Green sea turtles graze sea grass beds, increasing the productivity of those areas. Leatherback turtles are major jellyfish predators, providing natural ecological control of jellyfish populations. If the decline in sea turtle populations is allowed to continue, it could have severe consequences on many marine and terrestrial plant and animal species that depend on sea turtles for their survival. found next to the ‘Jardin de Luxemburg ’ park in Paris. cool by re-spraying them with spouting water. during my passing through the amazingly captivating city of Paris. and enriching segment on our wonderful TURTLE.